The Chester Investment Map provides a snapshot of the developments and opportunities awaiting investors in Chester. Click the links below to view the developments and projects. 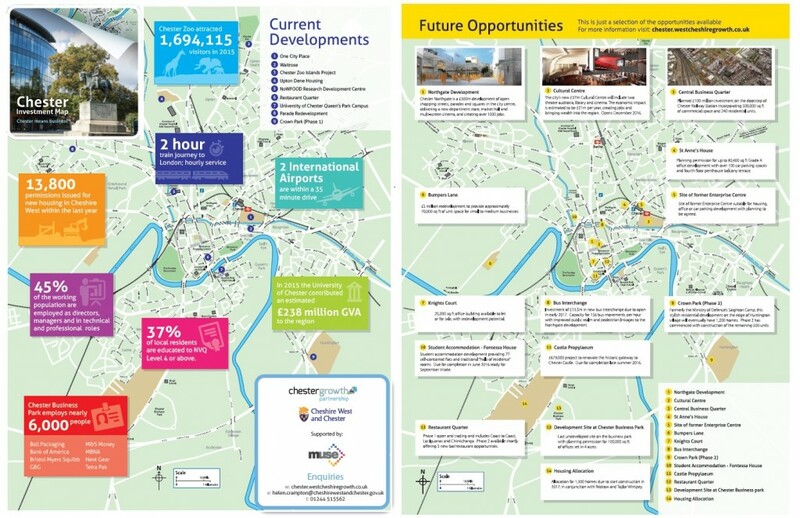 The main map – Future Opportunities – shows a selection of upcoming regeneration projects and investment opportunities. The reverse – Current Developments – gives an overview of recent successes in the city with some key statistics. Information about all of these sites is available throughout the Chester Growth Partnership website. If you have any further enquiries, please contact us. Site of former Enterprise Centre suitable for housing, office or car parking development with planning to be agreed. 25,000 sq ft office building available to let or for sale, with redevelopment potential. Further project information to follow when progressed and available. Formerly the Ministry of Defence’s Saighton Camp, this residential development on the edge of Huntington will have 1,200 homes. Phase 2 has commenced of the remaining 500 units. Last undeveloped site on the business park with planning permission for 100,000 sq ft of offices set in 4 acres. Planning permission for up to 80,400 sq ft Grade A office development with over 100 car parking spaces and fourth floor penthouse balcony terrace. £5 million redevelopment to provide approximately 70,000 sq ft of unit space for small to medium businesses. Further information to follow. Student accommodation development providing 77 self-contained flats and traditional ‘halls of residence’ rooms. Due for completion in June 2016 ready for September intake. Phase 1 open and trading and includes Coast to Coast, Las Iguanas and Chimichanga. Phase 2 available shortly offering 5 new bar/restaurant opportunities. Allocation for 1,300 homes due to start construction in 2017; in conjunction with Redrow and Taylor Wimpey.